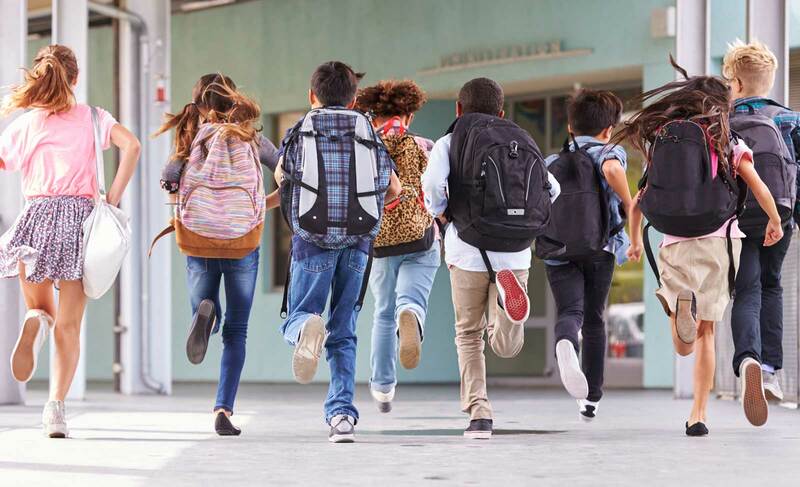 Organize School Volunteers as Easy as A-B-C! 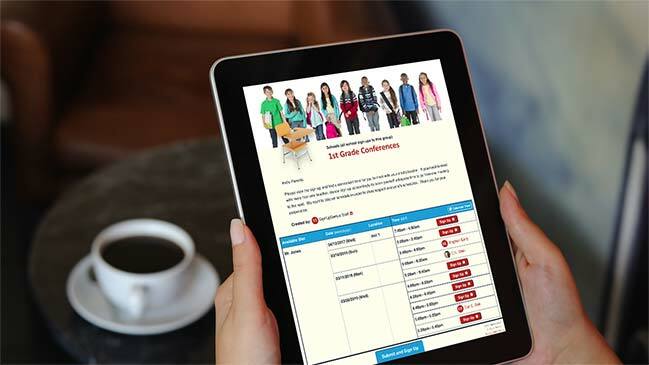 Schedule parent teacher conferences, organize volunteers and plan school book fairs and fundraisers with sign up sheets. Schedule snacks and plan class parties for Christmas, Valentine's Day and more. 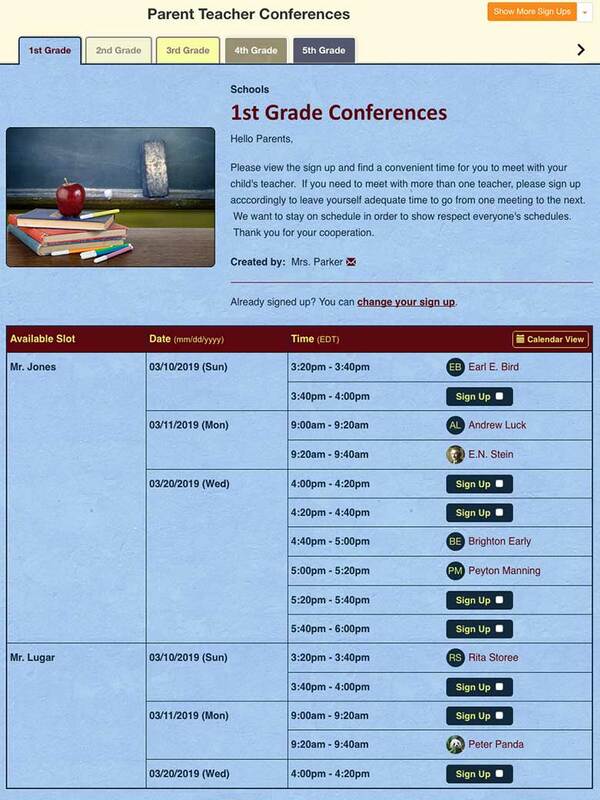 Organize school sign ups for parent teacher conferences. 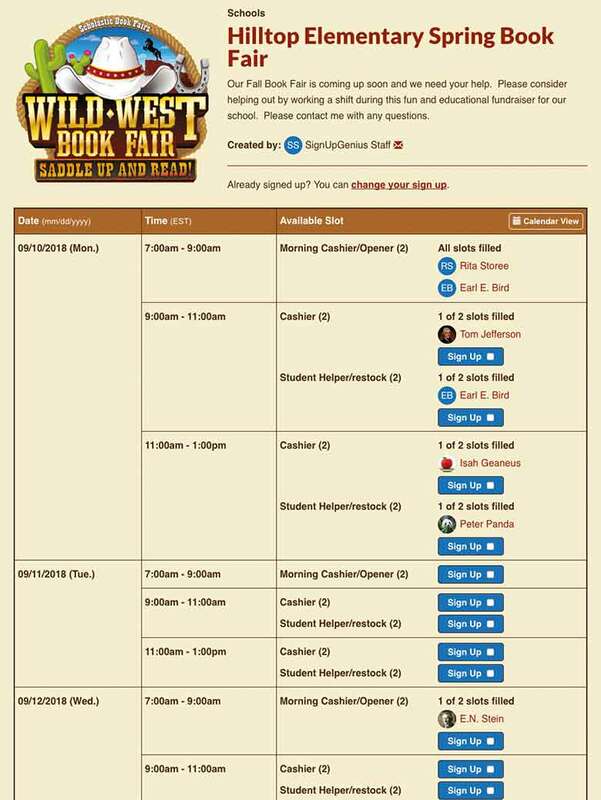 Parents can choose and swap timeslots. 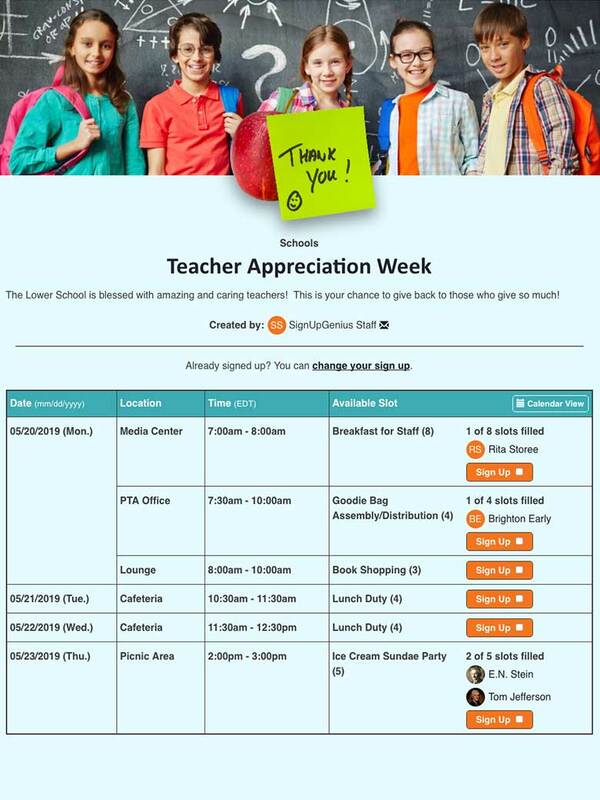 Coordinate Teacher Appreciation Week with a staff potluck, group gifts and more. Schedule book fair volunteers to help raise more money for your school. Coordinate parent volunteers for lunchroom duty, carpool line or classroom help. 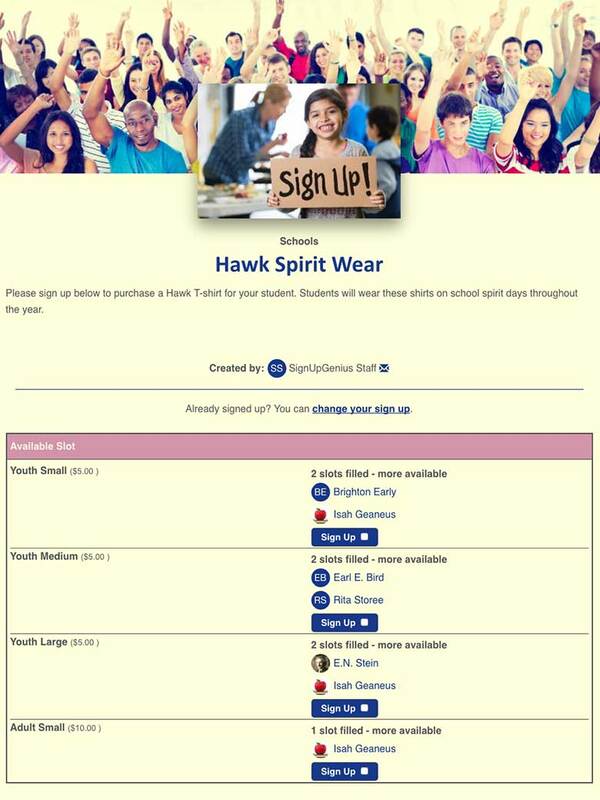 Sell spirit wear, collect money for fundraisers and capital campaigns and buy tickets for school theater performances. 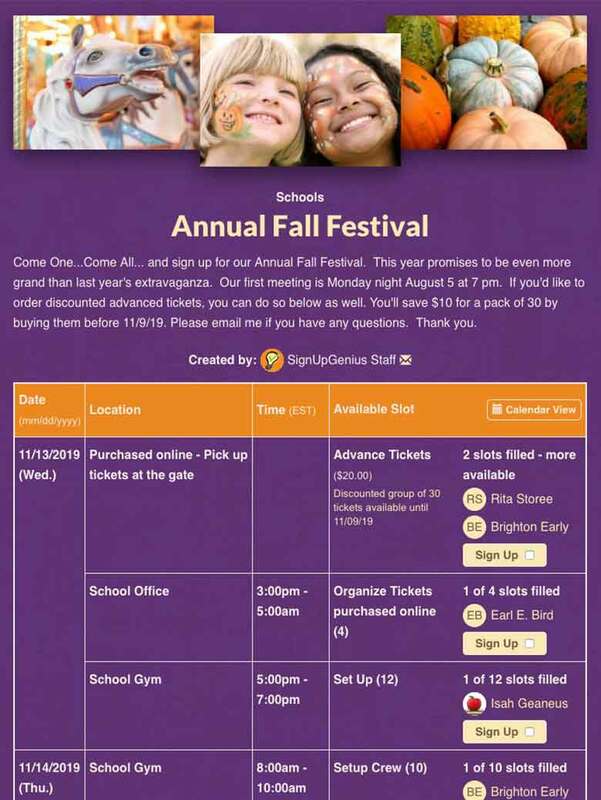 Organize fall festival or spring carnival booths, sell raffle tickets and schedule volunteers. 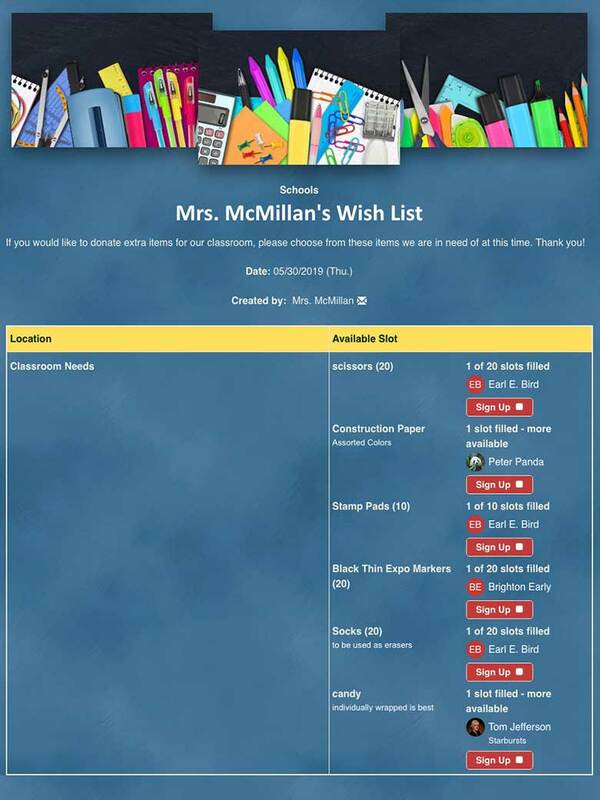 Collect school supply donations, classroom party supplies and more with a sign up. 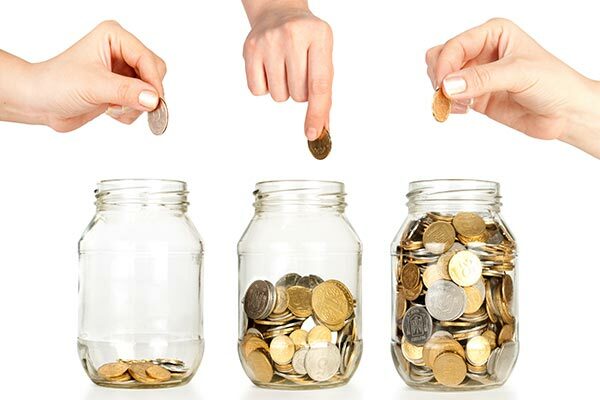 Raise more money with creative fundraising tips for your school. 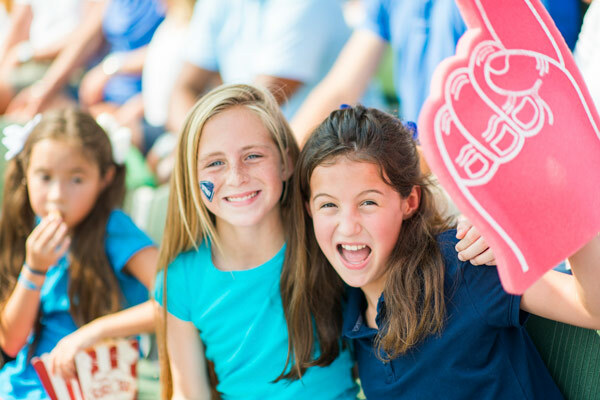 Plan spirit week with these fun and festive ideas for your school. 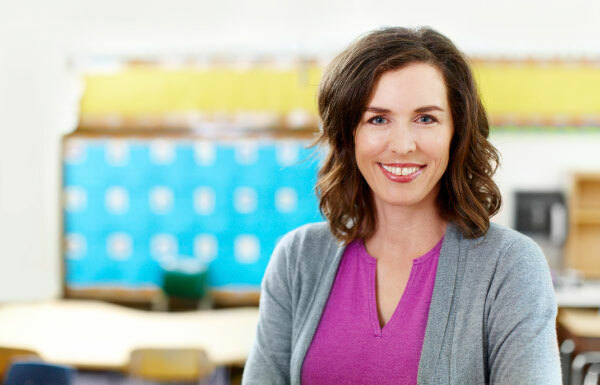 Prepare for parent teacher conferences with these must-ask questions and our guide. 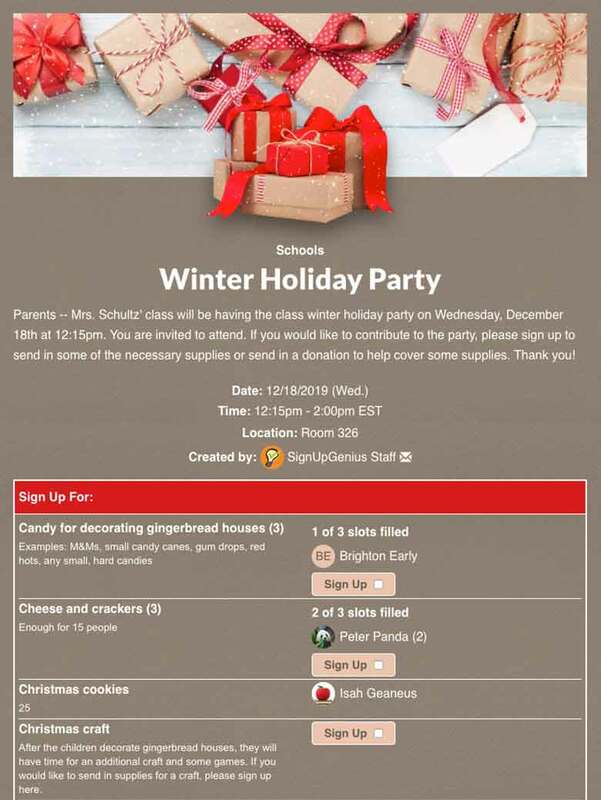 Improve parent communication, plan class parties, teacher help, snack donations and more. 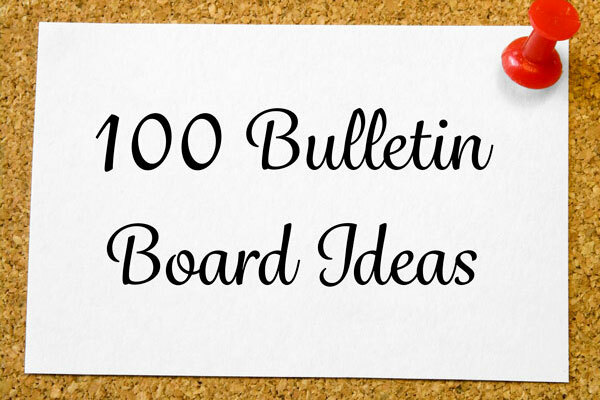 Decorate your school or classroom bulletin boards with creative ideas. 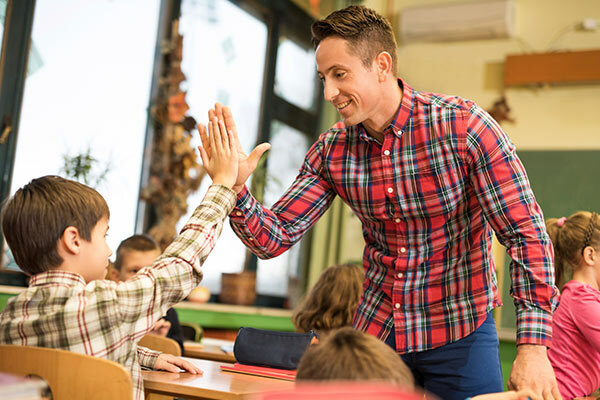 Implement teacher organization ideas and classroom management tips. When the Akins High School Band was approached with the largest fundraising partnership in its band's history, they jumped right in. Then, as the partnership grew, they discovered just how difficult coordinating hundreds of volunteers could be. The Akins High School Band Boosters turned to SignUpGenius to coordinate parent volunteers for concessions to help fundraise for the band. I love this site! As a teacher, it is great because it really cuts down on papers. It is a great way for parents to sign up for exactly what they want (parent teacher conferences) without any confusion of times/days. It is great to use for classroom donations/ parties. Don't know what the teacher still needs for the party? Just check SignUpGenius! 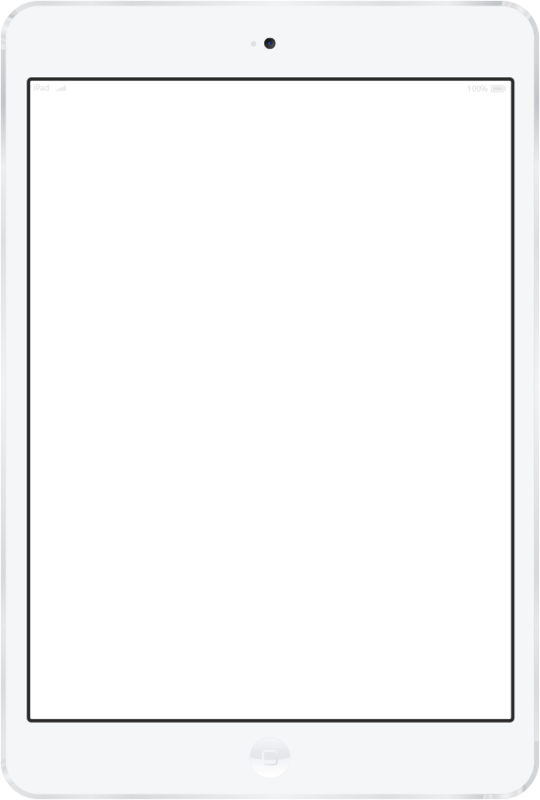 I have used SignUpGenius for the past few years, and it really has made a huge difference in my life. I became the volunteer coordinator for the PTSA in our high school and introduced using SignUpGenius to recruit volunteers for each event. I also utilized it when I created a "Teacher Appreciation Dessert Buffet" by setting it up to list out desserts, supplies, prizes, etc. I love that it is simple to create, simple for people to sign up, creates reports and sends out reminder emails! It has honestly saved me so much time and energy. Keep up the good work! We are having our first activity period tomorrow! 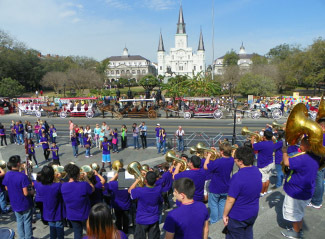 Over 300 kids signed up for clubs and activities the last couple of days, and they LOVED it! Thank you so much for all your help in getting this started. It's hard to believe that I haven't paid a dime for it. How do y'all do that? All of you have been very helpful! SignUpGenius, I LOVE you guys! My book fair volunteer effort was the pits - hundreds of emails with tons of overlap and random problems. Then I found you guys and my project has been rainbows and unicorns ever since. No more multi-day long email threads to discuss a two-hour time slot, no more toggling between emails, drives and Excel, no more dealing with people when I have a million other things to do! Thank you for your service to an overworked community of teachers! As a mom, I'm such a huge fan of SignUpGenius! It's one of my can't-live-without websites for navigating school life with my kids, and I think that every mom I know would agree. Recruiting, scheduling and keeping track of 80 volunteers each month to work in our school cafeteria used to take hours! SignUpGenius simplifies it all. Our parents like it to because it's easy to sign up with friends, and they don't have to wait for me to get back to them to get on the schedule. Thank you for creating this site! You make my job look easy. 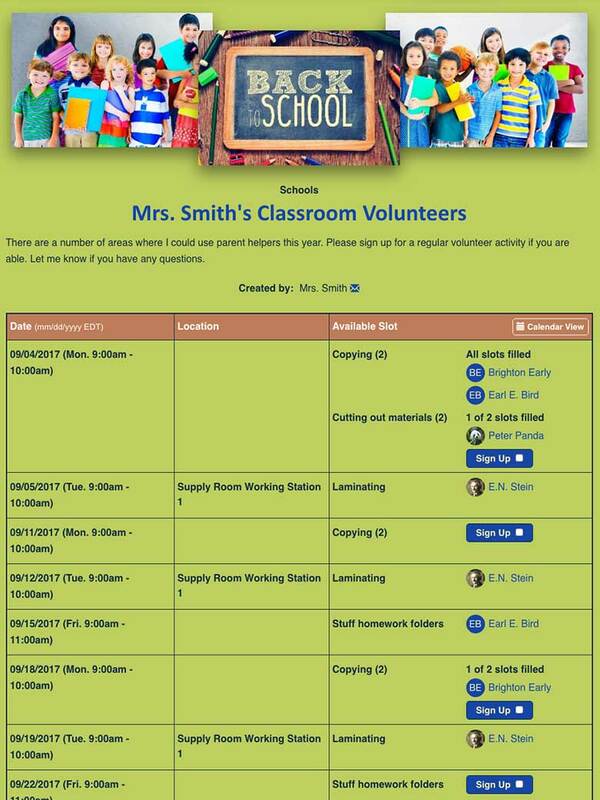 Parent volunteers and school staff can see all needs once and sign up 24-7. Admins can create a school-wide sign up or teachers can create their own.